I love mornings. What a gift to have a bright, new, fresh start every 24 hours. Next to my devotional time and my shower, breakfast is the third main excuse for loving mornings. 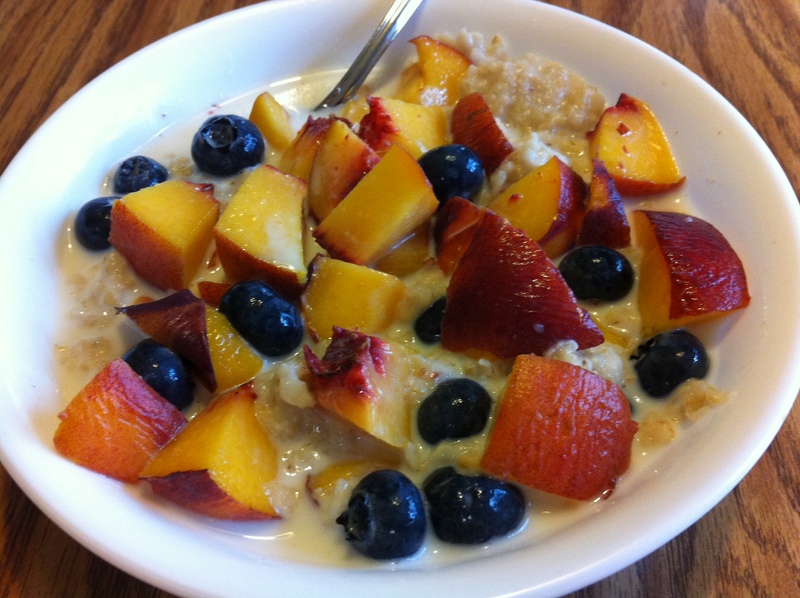 My current favorite breakfast menu item is oatmeal smothered with fresh peaches and berries. When I used to smother my oatmeal with br own sugar, I experienced only a singular taste sensation: sweet. Kicking the sugar habit has freed my taste buds to discern and relish all the nuances of the earthy, tangy, delicately sweet, savory, umami, etc. flavors that had been overpowered by my high tolerance for sickeningly sweet foods. It also makes me happy that research supports the notion that breakfast is the most important meal. John Hopkins School of Public Health gives some convincing reasons and some yummie recipes. I am a creature of habit and don’t mind eating the same thing most mornings, but if you are easily bored and need some snazzy ideas, you can download a free healthy breakfast cookbook here.